Summer is coming, even though the weather in Chicago has been hit or miss lately! With the nicer weather and the kids coming out of school we’re all planning upcoming trips. 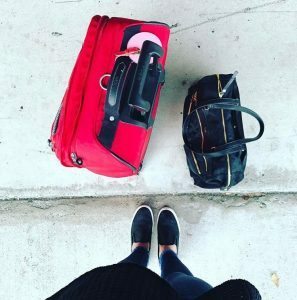 Whether you’re traveling close to home or far, far away, keeping up with your dental routine while you’re away is still super important. Maintaining excellent oral hygiene habits while on-the-go isn’t easy; so that’s why Dr. Emery’s team has put together a dental travel tips and tricks to help you plan accordingly. We’re always on the go! So it’s not always the most practical to dig out your entire toiletry kit while you’re at a Disney World bathroom or on an airplane. However you can still make keeping up with brushing and other dental hygiene habits easier, though, by carrying travel-size products along with you in a purse or carry-on bag. A travel-size toothbrush (with carrying case), toothpaste, and small bottle of mouthwash can easily fit in a small bag, which means you have no excuse to skip brushing (or at least rinsing) while on-the-go! One of the biggest mistakes travelers make is forgetting (or deciding not) to floss. After all, the Louvre is massive and we can’t miss anything, right? But truthfully, it only takes about 30 seconds to thoroughly floss, which is less time than it takes to post a Instagram pic of you in front of the Venus de Milo, so don’t use traveling as an excuse to take a vacation from this important oral health habit. To make flossing a little easier and more convenient, consider packing a small baggy of dental floss picks for easy on-the-go flossing. If you’re climbing Macho Picchu, there probably isn’t a sink around to brush. It happens. The best thing you can do here is to avoid eating or drinking anything with high amounts of sugar, and to rinse your food down with water when you get the chance. This will help to rid your mouth of at least some of the decay-causing bacteria until you get a chance to brush and floss. With these tips in mind, you’ll be ready to head off on your next trip without neglecting your teeth in the process. And while you’re at it, why not LINK TO CONTACT schedule your next hygiene appointment with us before your trip? Safe travels from the Sugar Squad!